I walk by this counter every day – multiple times a day. The counter sits atop cabinets in the hallway. There are cabinets above. These cabinets provide valuable storage space for stuff that we actually use: linens, computer and electronic essentials, paperwork that needs to be accessible, but out of sight, etc. The countertop – not so much. It is and has always been a dumping ground for stuff, crap and junk. Stuff that doesn’t have a home. Crap that I can’t make a decision about. Junk that I don’t know what to do with. A little mini-tableau of my life. Projects undone. Decisions unmade. Procrastination and hesitation. Decisions will need to be made today. I am going to get it cleared off – again. This is not the first time I’ve tried to work on this. It probably won’t be the last. I’ll just keep trying. Today. 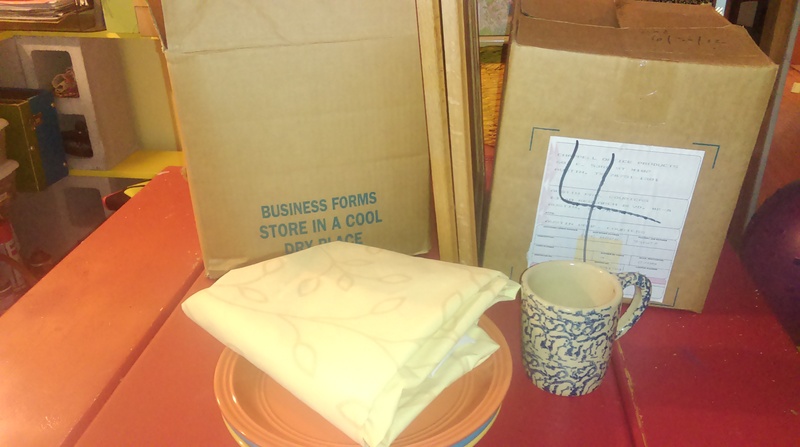 More boxes of old business paperwork – recycle. Dishes we don’t need – donate. A shower curtain – only one shower, we probably don’t need two curtains – donate. Two cabinet doors from a cabinet we removed above the hallway desk. They’ve been sitting in the hallway for a month. We probably don’t need doors for a cabinet that doesn’t exist anymore – burn pile. As I look at the box of things I’ve chosen to declutter this week, it’s interesting to note that there is not a thing that I would choose to pull out and keep. If I saw any of it in a thrift store, I wouldn’t be inclined to purchase it. It’s just not stuff I care about. Why was the decision to declutter it so hard? Why didn’t I see that it was sitting there waiting to be dealt with? Why is it so difficult to clear it out? Just questions. The answers will come. The decisions will be made. The space will be cleared. I can and will do this.